Rockford Files Remake Pilot Bombs? MURDER! is one of Alfred Hitchcock's early British sound films. It has some creative Hitchcock touches and shows technological innovation, but on the whole the film has a muddled storyline which does not reflect Hitchcock's usual crisp clarity; I found it very slow going. The film has a wonderful opening, with Beethoven's 5th crashing on the soundtrack as the title MURDER! appears. The viewer then becomes aware of a murder as British villagers react to sounds and screams. This sequence is very creative, yet the film's initial excitement peters out as the accused murderess, Diana Baring (Norah Baring, in an odd performance), stands trial. Sir John Menier (Herbert Marshall), a famous actor, is on the jury. Sir John quickly regrets agreeing to a guilty verdict and sets out to find the real murderer. I love Hitchcock, Marshall, and British films, but I had trouble plowing through some of the plot in this one. The story is not clearly laid out -- for instance, it may have passed by me but I never really did understand why Sir John slept at the policeman's house -- and some of the supporting characters tend to blend together into an indistinct blob. The sound levels on the print I saw were quite variable, and at times it was difficult to make out the dialogue, such as in the scene when Marshall is talking to Una O'Connor while she's holding a howling baby. Added to the above are confounding moments which are never explained, most notably when someone arrives to see Sir John and there is a closeup of the visitor's feet as he walks across the carpet; the man is shown walking on a bobbing surface rather like that of a waterbed. What on earth? I assume this was some sort of symbolism but the meaning escaped me. There's another moment when Sir John is talking to Markham (Edward Chapman) and a picture of a meal momentarily flashes on the screen. Sir John was hungry, apparently? In many ways this is a strange movie. I mean, a transvestite trapeze artist? You've got to see it to believe it. The film has some interesting technological innovations for its day. For instance, there is a scene where the viewer hears Marshall's thoughts as he looks into a mirror. In order to achieve this effect Marshall's voice had to be recorded and played "live" on the set during the scene. Dubbing had not yet been invented! Marshall is the best thing in the film, and his voice is also the easiest to understand on the soundtrack. A decade later Marshall played a key role in Hitchcock's classic FOREIGN CORRESPONDENT (1940). There are some familiar Hitchcock touches. For instance, he regularly used theaters in his films, and that's one of the settings in this instance. 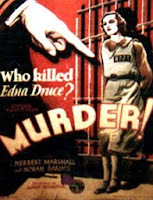 Within just a few short years after this film was released, Hitchcock would be turning out classics such as the original THE MAN WHO KNEW TOO MUCH (1934) and THE 39 STEPS (1935). MURDER! is not at that level, but it's interesting to see some of Hitchcock's early work as his style developed. The original British print was 104 minutes; that print can be seen on Turner Classic Movies. This movie is available on DVD in multiple editions, and it has also been released on VHS. That's a great quote, Raquelle. (I haven't seen HOPE FLOATS in ages...) This one was definitely slow. I love his later British films like YOUNG AND INNOCENT and THE LADY VANISHES.